Jacques Cousteau (kūstō') was a filmmaker and self-taught oceanographer, and by far the most famous undersea explorer of the 20th century. He learned to swim when he was an infant. Swimming became his hobby, and, by adolescence, his passion. Later in life he was sometimes called "the manfish". He joined the French Navy fresh from high school, and served for 27 years. During his Navy time, he made several improvements to breathing machines for longer dives, and developed new and improved methods of underwater photography. In 1943, with French engineer Emile Gagnan (1900-1979), he invented the Aqua-Lung, a mechanism that allows divers to swim underwater while breathing compressed air, and remains a component in modern scuba diving equipment. His earliest films were about deep-sea hunting and fishing, but he made his fame on conservationism. 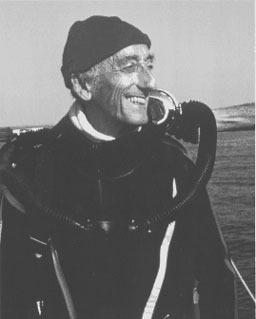 He won three Oscars for theatrical documentaries, but was best known to ordinary people for a long-running series of television programs, beginning with a 1966 TV special, The World of Jacques-Yves Cousteau, and continuing through and beyond the long-running The Undersea World of Jacques Cousteau. He traveled the world's oceans in a converted minesweeper named Calypso, the ship that served as the recurring motif for his television adventures. The programs were narrated with a ceaseless sense of wonder by Cousteau himself, in English through a frequently-parodied Gallic accent, as he described and showed life at the depths of the "water planet" and made science popular on prime time television world-wide. Contrary to the popular perception, though, Cousteau was rarely on Calypso except when cameras were rolling. His schedule was busy with fundraising, speechmaking, political lobbying, writing numerous books, and his day job as the Director of the Oceanographic Museum and Aquarium in Monaco for more than three decades. He was an environmental activist in a time when that phrase needed to be explained, campaigning, for example, against a 1960 French plan to dump nuclear waste into the Mediterranean Sea. He established the Cousteau Foundation in 1973, dedicated to marine exploration and research. His last filmed work was a 1989 documentary on the Exxon Valdez oil spill in Alaska, and long after his death his name and work are still despised by those who oppose virtually any steps to protect the environment. He had two children with his first wife, Simone, and two more with his long-time mistress, Francine, whom he married in 1991 after his wife's death, and who is now chair of the Cousteau Foundation. Several of his children and grandchildren have worked in documentary filmmaking, environmental protection, and eco-tourism, leading to at least two well-publicized lawsuits over the rights to the family's famous last name and formidable estate, which includes an enormous catalog of films, television programs, photographs, and books, control of the Cousteau Society, and the fate of the fabled Calypso. His brother, Pierre-Antoine Cousteau, was a prominent fascist writer and Nazi sympathizer during World War II.